Juice=Juice’s Miyazaki Yuka is this episode’s navigator. 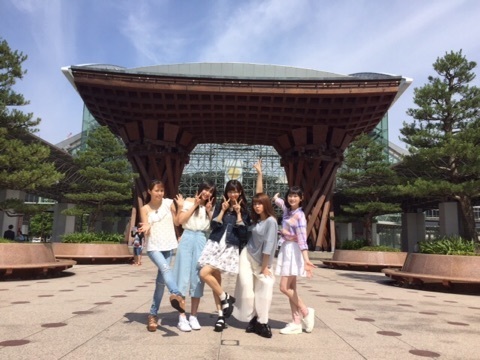 Juice=Juice recently wrapped up their tour at Kanazawa, in Yuka’s hometown of Ishikawa prefecture. As Juice=Juice’s first hall concert in Kanazawa, Yuka was nervous at first. But as it also was their final concert for that tour, it was a really wonderful show, everyone was enthusiastic, and even the fans had wonderful smiles on their face. All the members also got to eat at Hachi-ban ramen, a major ramen chain in Ishikawa. The noodles are thick, so it might not seem like ramen at first glance to outsiders. However, it received the approval of ramen-loving Kanazawa Tomoko-chan. Yuka hopes that they’ll all be able to go to Hachi-ban ramen again. Whenever Juice=Juice hold performances in Kanazawa, Yuka’s family will never fail to buy them gifts. At first Yuka told her family that it wasn’t necessary, but she then realised that her family enjoyed giving gifts – and Ishikawa has plenty of things that make good gifts. June marks the beginning of the rainy season in Kanto. Yuka elaborates on types of rainfall – ‘Otokozuyu‘, where it rains heavy but ends quickly, and ‘Onnazuyu‘, where the rain is light but prolonged. When Yuka thinks about the rainy season, she’s normally got onnazuyu in mind, rain that goes on the whole day. Heavy but short bursts of rain bring to mind the squalls that happen in Okinawa. The rainy season also means that it’ll often be cloudy, which may lead to a heavy mood. But listening to the sound of the rainfall relaxes Yuka. In fact, when you look up ‘relaxing sounds’, a bevy of rainfall recordings turn up. She recommends looking them up if you’re interested. And speaking of the rain, the person who pops to mind is none other than Yajima-san. Yajima-san had recently talked about no longer being an ame-onna – a woman whose presence brings along the rain – but Yuka doesn’t feel that’s the case. There’s such a strong association between Yajima-san and the rain that the official Hello! 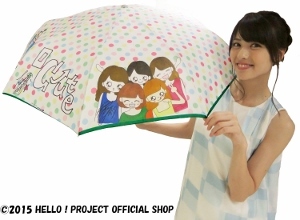 Shop even released a Yajima umbrella. Yuka finds it very much like Yajima-san to be willing to take the Mickey out of herself, humbling herself to illustrate and promote the umbrella. As unlikely as this word seems coming from the MiyaMiya duo, Karin has taken up regular exercises to build her strength in her abs, back, and arms. She wants her arms to be more toned, especially, but she likes seeing the progress she’s making in general strength, as well. 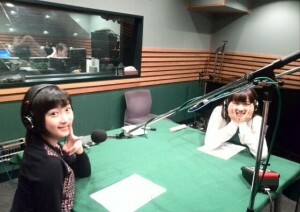 Yuka admits to never really doing any exercise, but Karin asks her, regardless, what muscles she has most confidence in. Yuka laughs, as her arms can’t compare to Karin’s, but she does say that she has kind of a six-pack. Well, you can see the outline of her abdominal muscles, at least, even though she can’t remember the last time she did a sit-up. She also says that while Karin does tend to be a more muscular and toned member of the group, Tomo has the most powerful image of being ripped. Karin acknowledges this to be true, even though she doesn’t think she’s ever seen her do any exercising. That’s the power of Rose Quartz. This show was also recorded following the opening performance of Koisuru Hello Kitty! The first one is out of the way, now everything should be easy, hopefully. Karin, the star of the show, was quite nervous before going on and said she was squeezing Yuka backstage before and after the show. That’s the only part she remembers because she has completely blanked on what happened on stage. Of course, she received a tape of the performance to go over and adjust things the next time, but that’s the only way she would have known. She has a lot of improvements to make, she says, but Yuka says her performance was fine. 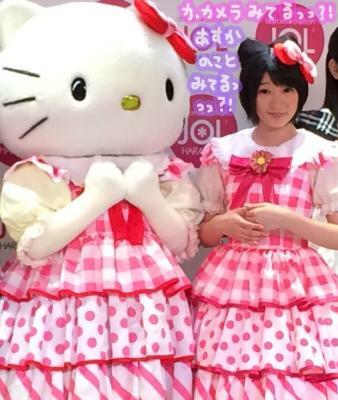 All she could see when she looked at Karin was Hello Kitty, and that’s the most important part, after all. Karin introduces the show with the word socks because she really likes 5-toed socks. However, she wore her own pairs a little too much and they got holes in them, and so she’s been wearing her other socks more and more so that her intact socks can stay that way. She originally wrote the opening word as “5-toed socks,” but since she hasn’t worn them in a while and isn’t wearing them today, she felt like she just had to say “socks” in general instead. 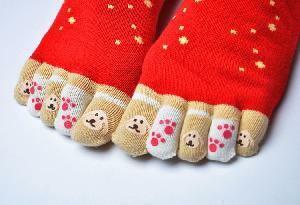 This topic, however, has made her want to start wearing 5-toed socks again because she loves them so much. Yuka isn’t so sure about this because of the holes, but she has noticed that Karin seems a little more sure of herself when she wears them, so maybe she should go back to representing the 5-toed socks. Toe socks give me the willies, actually. As Autumn is coming into full swing, Karin has also taken a liking to looking up at the sky in the evening. She mentions that Orion has come into view at night now, and that if you look up at the stars every night you’ll start to notice a different in them, “Like, ah, that star was brighter last night than it was tonight.” She also really enjoys the feeling of looking up at something so much bigger than herself that makes her feel small and like a child, it’s very comforting. Yuka realizes that she hasn’t looked up at the night sky in a while, and even though she used to look at it on her way home or before she went inside, she usually just goes straight home and in the house now. She’ll make sure to look tonight, though. Yuka’s favorite thing about fall is that her favorite kinds of ice cream come out with fall flavors. One of her favorites is Haagen-Dazs’ new blueberry cheesecake flavor. Even just the name sounds tasty. Karin isn’t so sure, though, because it has “cheese” in it and she much prefers the taste of vanilla to the taste of cheese, so she usually ends up getting vanilla if she ever gets Haagen-Dazs.